Did you know that there's such a thing as "dungeon crafting?" I didn't, until recently. There are a growing number of YouTube channels dedicated to teaching viewers how to craft all manner of terrain and building components to be used in Dungeons and Dragons and other roleplaying and tabletop games. My friend, Make: and Geek Dad contributor Jim Kelly, has recently launched a new dungeon crafting channel called Game Terrain Engineering. 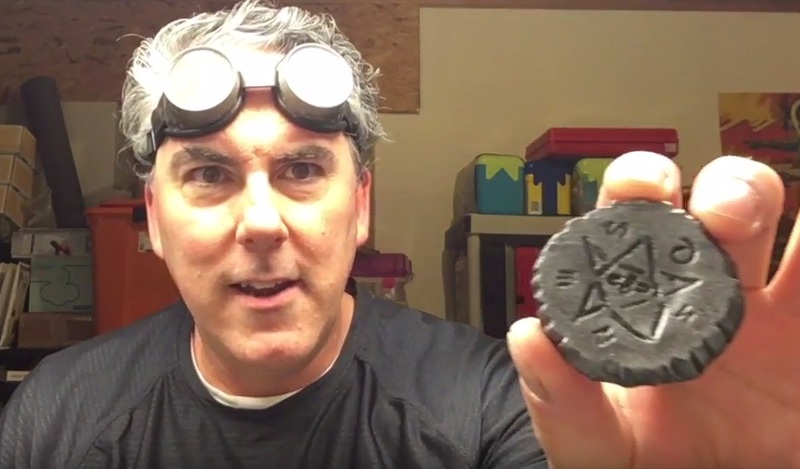 So far, he has posted videos for such projects as making towers, tombs, crypts, columns and doors, and my favorite, how to make monuments to your fallen D&D characters! In the latest episode (above), Jim gets to work on creating a set of red herring playing pieces for his (and my) current favorite game, Frostgrave (read my WINK review of Frostgrave here). Osprey Games, makers of Frostgrave, have just released an awesome new expansion for the game, a deck of 40 cards called Ulterior Motives. These cards contain special game objectives that players draw before beginning play. I love this game mechanic of adding individual player objectives to an existing game via a deck of cards. Frostgrave is not an RPG, it's a narrative fantasy skirmish wargame. Adding these individual motives helps to bring more play-depth and narrative flavor to the game. Some of the objectives in the Ulterior Motives pack are revealed right when the card is drawn. Others remain secret until you make your move as indicated on the card. To get other players off the stink of what you're up to, there are a series of red herring terrain pieces that are called for (a statue, a zombie, a pit, a portal, a sarcophagus, a trap door, an arcane disk, and a runic stone). Since you don't know which of these eight red herrings may be listed on the card you draw, it's ideal to have all of them made beforehand. In this video, Jim does just that. He speed-builds seven of the eight (a zombie can be bought) to give as a gift to another Frostgrave-playing friend. One of the many things I love about Frostgrave is that it's a game that's best played on lots of terrain, and things like treasure tokens and magic circles and portals for teleportation are called for. Osprey and Frostgrave's creator, Joseph McCullough, have intentionally created a game that encourages players to make a lot of their own terrain and game components (and there is a growing player community doing just that). It's great to see the dungeon crafting channels, like Game Terrain Engineering, rising to the challenge and tutoring the rest of us on how to make what we need to go adventuring within the snowbound, eldritch ruins of the Frozen City. Ingo Dwelling designed a Braille D20 die and uploaded the model to Thingiverse. Here’s a time-lapse of it being 3D printed by the folks at Adafruit.